I lost my head in December and inhaled 12 books in 14 days. My monthly tally came in at an unprecedented 19 books, 12 of them Christmas themed. 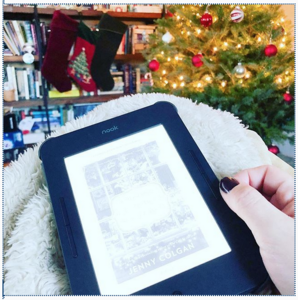 I gave myself the week between Christmas and Jan. 1 off and spent most of it parked in front of my Christmas tree with a book in my lap. It was bliss, to be honest with you. Some December stats: Of the 12 Christmas-themed books I read, four were rereads: Charles Dickens’ A Christmas Carol, Dylan Thomas’ A Child’s Christmas in Wales, M. C. Beaton’s A Highland Christmas, and Valentine Davies’ A Miracle on 34th Street. It seems these are becoming my December staples. Three other rereads this month were all work or research related: Paulo Coelho’s The Alchemist, Rick Riordan’s The Lightening Thief, and Harry Mount’s Harry Mount’s Odyssey: Ancient Greece in the Footsteps of Odysseus. The following list of memorable reads is limited to books I read for this first time this month. I don’t know that they were the best books I read (how can you possibly top Dickens?!). But they were books I was happy to have spent time with, books that made me think and feel. This the second in Townsend’s middle grade series about Morrigan Crow, a young girl with extraordinary powers. Until she turns 11, her powers are considered a curse, and she is an outcast within her society and family. But on the eve of her 11th birthday, a man called Jupiter North whisks her away to a magical new world. I don’t want to delve too deeply into particulars for those who have not yet read it. How to decide if this series is for you: If you like magical elements, especially in a school setting, parallels to Harry Potter (overt), and sticky conundrums (moral and practical), you might enjoy this. I have and look forward to reading the next installment. I listed to this on audio and found it compelling, with several twists and a satisfyingly redemptive ending. Some of the twists I saw coming, and some I didn’t. I appreciate any book that can take me by surprise. It's a thriller, so the less you know, the better. This is an eerie children’s book about a young girl called Frank and her oddball classmate Nicholas. Frank is horribly bullied. Nick is an outcast. After they’re forced to face her tormentors together, a friendship blossoms between them, and Frank discovers why Nicholas is the way he is. If you don’t appreciate magical realism, you probably won’t enjoy this. If you do, you may find this intensely touching and transporting, as I did. In this Christmas romance, Anna, after a broken engagement, travels from New York to England to celebrate a solitary Christmas. When the B&B she was meant to stay at floods, she ends up camping out with Colin, the B&B owner’s cousin. Cue the romance. It’s quite a short book, perhaps more novella length, that I acquired for $1.99 on my Nook and had low expectations for. Perhaps for this reason, I was capable of being moved by the two main characters and their quest for love. Both have moments of uncertainty and awkwardness, not knowing what to say or how to respond but driven by curiosity about and a desire to be kind to each other. I just loved being inside these two characters’ heads. I also appreciated that this was not a hate-to-love story, a trope I find tiresome and unrealistic (based on anecdotal evidence). Anna and Colin stumble in their communication, in facing their very real obstacles, and the ending is a bit tidy. But the emotional truth of their responses to and feelings for each other resonate. This is a children’s book about a girl called Amelia, the first child to receive a present from Father Christmas and whose faith in him gives him the magic boost he needs to make Christmas happen. But there is a problem: Something terrible has happened to Amelia, and her faith begins to evaporate. Father Christmas must figure out how to restore it in order to save Christmas. Charles Dickens is a character in this novel, and I noticed quite a few parallels with his Oliver Twist. That made reading this extra fun for me, but I do believe The Girl Who Saved Christmas is an enjoyable Christmas adventure all on its own. This is a cozy murder mystery set at Christmas and, as implied by the parenthetical, one of many starring Jaine Austen (ha). I had some bad luck with cozies this year, and it made me think of what makes them enjoyable vs. boring. What made this interesting is the banter between Jaine and her friends, the quality of description, and the choice of what to describe. I think it comes down to empty filler vs. fun filler. I don’t need to know every move a character makes from the moment she reaches for her coffee maker to the moment she takes her first sip of java. However, if the character is engaged in humorous banter while she is making the coffee, that’s entertaining, even if it’s a digression from the main action. You know what I mean? Levine’s writing is sassy and light-hearted, and she has a nice eye for what details to focus on. I can see myself dipping into her mystery series this year. I’m very forthright that Morgan is a bit too steamy for my taste, but this was offered at $1.99 in a Nook sale. Well, those sales are my Waterloo, so into my library Moonlight Over Manhattan went. I’m quite glad it did because this book touched my heart. As a child, Harriet was emotionally abused by her father and shielded by her brother and twin sister. She had a tendency to stutter when under stress and was bullied for it. As an adult, she feels more comfortable with dogs than humans and relies on her sister to shield her from undesirable interactions. But her sister has fallen in love and moved out of their shared apartment. Harriet wants to take more charge of her own life and so pledges to do one thing that scares her every day for the month of December. In a roundabout way, this leads her to meet Ethan, and the book is their love story. I’ve been trying to understand why this book is so affecting to me, and I think it’s down to Harriet’s earnest search for self-love and acceptance. I especially valued how that narrative runs parallel to her relationship with Ethan. Harriet’s emotional journey impacts how her love story develops, but it is not dependent on that love. That felt intensely important. I felt like Harriet was a productive role model for young women grappling with trauma and self-doubt. I thought about compiling a 2018 favorites list, but it seemed redundant. Most of those books have already appeared on the favorites lists I’ve shared monthly. Do you agree, or should I do a 2018 review in addition to this? Also, what were the most memorable books you read in December?